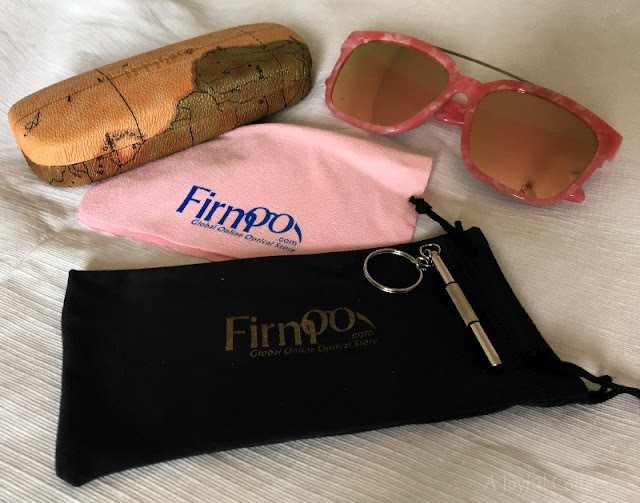 Firmoo is an online optical store with an unbelievable array of affordable prescription glasses and sunglasses, as well as non-prescription sunglasses. 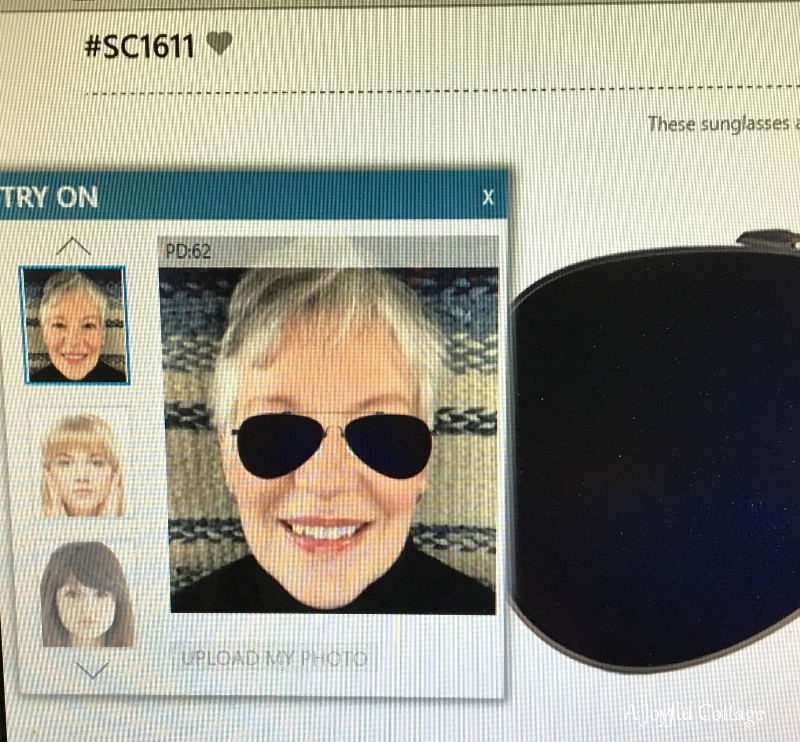 Ordering my sunglasses was super easy. 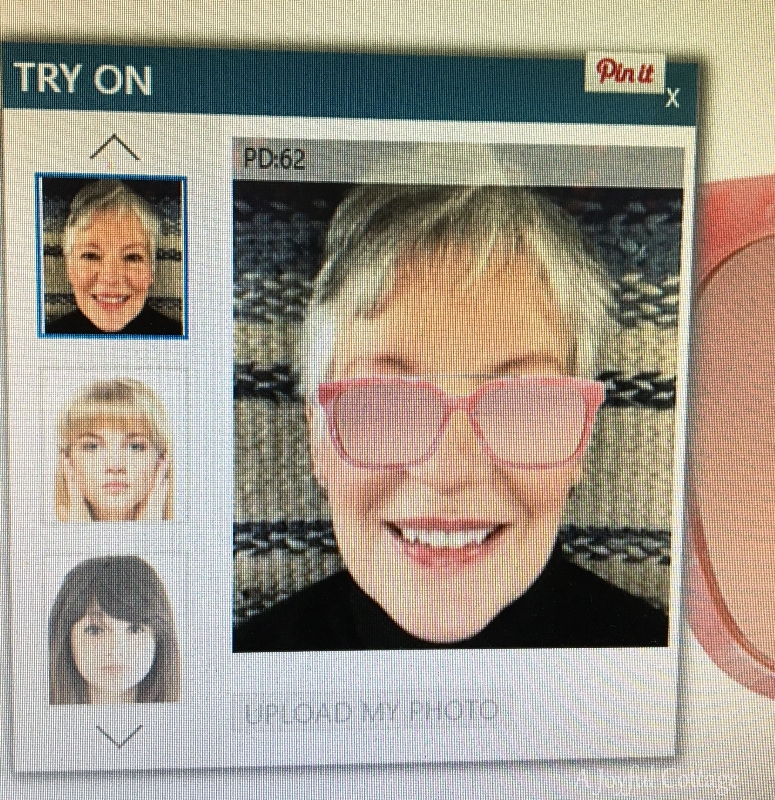 Their website is easy to navigate, plus they have a nifty tool that allows the customer to upload a photo of themselves for "try on". After trying on a plethora of sunglasses, I narrowed my choice down to two styles. I liked these aviators, but I own a pair much like these. So I went for something completely different -- Style OMJ8058. Now THAT's a fashion statement! Pink shades!! And cute little glasses decorate the arms. Who could resist that? 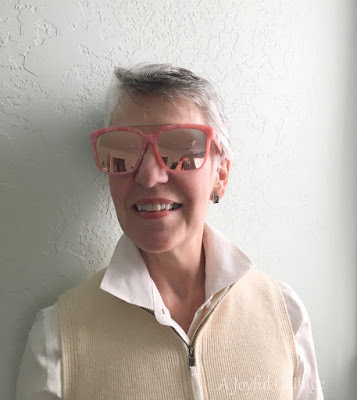 My sunglasses arrived by regular mail in about two weeks, which is what was estimated. 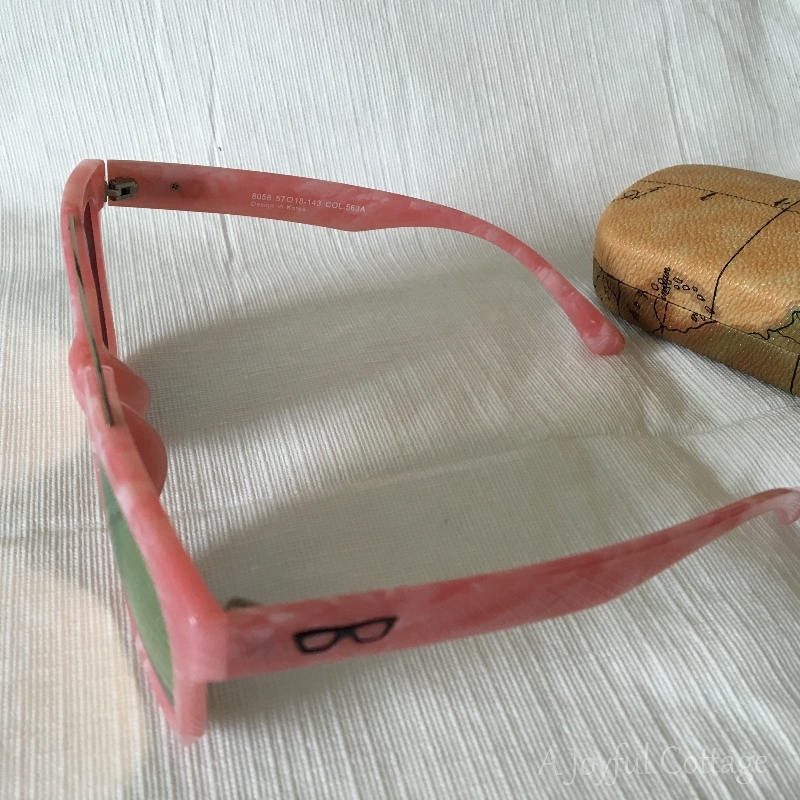 They came very well packaged; the glasses were wrapped in two layers of plastic, tucked inside the very cool hard case. Also enclosed was a soft case, a cleaning cloth and a glasses screwdriver on a key chain. Very handy. The sunglasses are very good quality, and they're light, which makes them comfortable to wear. I really appreciate that because often sunglasses hurt the bridge of my nose. Not so with these. 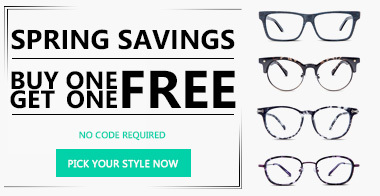 If you're in the market for glasses or sunglasses at great prices, check out Firmoo.com. Right now they're offering special Spring Savings. Click on the logo below to go to their site. Disclaimer: I received a free pair of sunglasses from Firmoo.com for review purposes. The thoughts and opinions expressed here are 100% my own and I received no monetary compensation. See my disclosure policy for more information. How cute! I love this company....they have so many great styles to choose from. You're stylin' now! Sassy glasses . . . and a very classy gal . . .
Love that white blouse, vest and hair . . . perfect you are in your "pinks!" I think you look über cool in Pink shades! This is so neat. My taste in sunglasses changes all the time. I don't dare buy anything expensive~~~ I lose them all the time!!! You wild woman, you. They look good on you. WOOOOO HOOOOOO!!!!!!! YEAH! I love the pink shades, I DO! I really love how the soft color goes with your gorgeous hair....nice fit and color. I had a pair of pink frames once that really looked good...I must try that again! Nancy dear, thank you so much for coming by my blog! Happy spring and live on, all shades of BLUE! You look pretty in all of them, Nancy. You are classy! LOVE Firmoo! I currently have 6 pairs from them, one of them prescription sunglasses. I was just online looking for what new frames I can find. It is an easy process and I have never had a problem with them at all. Fabulous!! I love that you chose pink! You are so ready for the spring and summer seasons now. You have the face and hairstyle for glasses. Pretty cool!! I think the pink looks very good. Sunglasses are important for the eyes. It shades against harmful rays. You sport these shade marvousley. You look awesome Nancy, so hip and stylish! Nancy, I'm not surprised you own a pair of aviators as these ones, even digitally applied, looks great on you! now, those pink ones remind me of old Elton john. What a diva you are indeed here. How funny. Oh gosh, I do love those! The little glasses on the sides are great! And who can go wrong with pink? You totally can wear the pink! How fun!